The Upper Mustang Trek brings you into the hidden world of the old Buddhist Kingdom in the remote trans-Himalayan mountain region of Nepal. Upper Mustang; described as a mystique valley and the last forbidden kingdom in Nepal was opened for foreigners just in 1992. 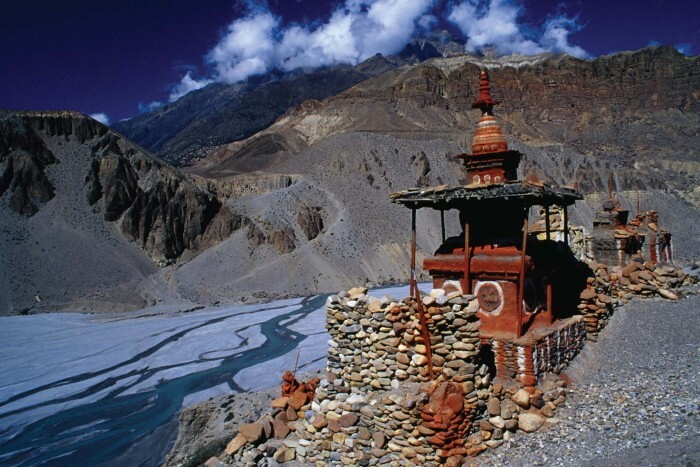 Trek to Upper Mustang allows the travelers to witness the heavenly beautiful Trans-Himalaya landscape, ancient Tibetan Buddhist shrines such as Stupas, Chhortens, Kaanis, Prayer walls, centuries old monasteries and the chance to interact with Tibetan Like people makes the tour lifetime memorable. Upper Mustang is also called mini-Tibet of Nepal which is a very famous trekking trail in Nepal. It is also known as Mountain Desert. The trekking to Lo Manthang- isolated region is a incredibly satisfying one for those who wants to experience the hospitality and warmth of the locals of Upper Mustang. Peoples believes that Guru Rinpoche had once fought with demon among the Mustang’s snow capped mountain, desert canyons, and grassland. Once Guru Rinpoche killed he Demon, it is said he scattered the body parts across the Mustang Valley : its blood formed the towering red cliffs and its intestines tumbled near to Ghami where peoples later on build the stone prayer wall, the longest prayer wall in Nepal, on top of the demon’s intestine. Mustang Trek is an exploration of the concealed valleys of upper Mustang, nestled between Tibet and Himalayas. The Upper Mustang Trekking is one of the best trek even in the monsoon season as the entire upper Mustang lies in the rain shadow, north of Annapurna and Dhaulagiri ranges, completely sheltered from the monsoon rainfall in Nepal. Mustang trek unfolds the fabled forbidden kingdom’s vast and arid valleys, eroded canyons, yak caravans, colorful painted mud brick houses on the back dropped of the Majestic Mountains Nilgiri, Tukche, Annapurna and Dhaulagiri. Mustang is one of those very few places in the planet that is surviving the very close niche life and that region was, until recently, a forbidden place for foreigners till 1992. The loneliness and isolation contributed the people of Mustang to conserve their lifestyles, religions and cultural heritages that remained unchanged for centuries. The high desert of the Himalaya receives very low rainfall making this region dry and parched, similer to the boarder of Tibetan plateau. The lo Manthang, capital of Upper Mustang, lying in the remote Himalayan region behind the Annapurna and Dhaulagiri Ranges, is a old traditional Tibetan village with very rare exotic culture. Domestic flight from Jomsom to Pokhara and viceversa. Our representative will be there in Tribhuwan International Airport for your warm welcome and to transfer you to the hotel. There you will have short briefing, after that you can relax your remaining time in Hotel room. After having breakfast we will head to Pokhara, enjoying the eye-catching views of Landscapes from our private vehicle. We will have lunch on the way. We will reach Pokhara in almost 6 hours. There we have the chance to enjoy boating in Phewa Lake. Overnight stay in Pokhara. Today we will take early morning flight to Jomsom, famous for strong winds, landscapes and the Apples. We begin our trek on an open trail alongside a beautiful valley and pass through Eaklibatti village before reaching Jomsom which is ideally located at the bank of two rivers. The village is beautiful with flat-roofed houses. Overnight stay in Kagbeni. We get our passes checked and begin our trek on a trail through the Kaligandaki River. After some walk we reach to Tangbe village and admire its narrow alleyways, white washed houses, barley and buckwheat fields, and apple orchards. We continue our walk passing the villages and crossing the river and reach Chele village. Overnight stay in Chele village. Today, the trek is little hard compared to the past days. Today we cross two passes, Taklam La Pass and Dajori La Pass. We will get the chance of enjoying the great views of Tilicho, Yakawa Kang and Damodar danda and pass by Ramchung cave. From here we walk on a trail above the village and reach a ridge and then we descend on a stream continuing our Trek to Syanboche. Overnight stay in Syanboche. Today in the beginning, we ascend to the Yamda La Pass at 3,850m. On the way, we pass by a beautiful tea houses, chortens and the beautiful villages. Our trail goes through Poplar forests and barley fields and reach Nyi pass at 4,010m. From here, we descend to Ghami village, one of the biggest village in the Lo region. The village is surrounded by the beautiful fields. Overnight stay in Ghami. Today we begin with a descend walk through a rough and often slippery trail. Then we cross the suspension bridge in Ghami Khola and begin ascending. We can observe the beautiful Maniwalls along the trail. Next, we cross Tsarang La Pass at 3870m and finally reach Tsarang village. Enjoying the beautiful views of this place we stay here overnight. We begin our trek by descending to a canyon and cross a river before beginning our uphill trek to Lo La pass. From the top of the pass we can observe the beautiful Lo Manthang village. Then we descend to Lo Manthang which is a beautiful walled village. From here the beautiful views of the Himalayas including Nilgiri, tilichio and Annapurna I, Bhrikuti Peak as well as Damodar Kunda. Overnight stay in Lo Manthang. Lo manthang is a beautiful walled town of the remote upper Mustang region of Nepal. We spend he day visiting three major Gompas of the town namely Jhampa, Thupchen and Chhoeda. All of these gompas have undergone expert restoration over last two decades. We can also visit another beautiful village Tinkhar located north west of Lo Manthang. Overnight stay in Lo Manthang. We follow the different route when returning from Lo Manthang. We pass through Gyakar village which houses a century old Ghar Gompa with beautiful rock paintings. The local people believes that, anyone who makes a wish at the Gompa will have it fulfilled. We explore to Gompa and continue our trek to Dramkar. Overnight stay in Drumker. We begin our trek early in the morning to avoid strong winds descend on the most part of the trek. Before reaching Ghilling, we pass through the dry plateau and fields. The walk can be relatively difficult because of the strong winds blowing on our face. Ghilling is mostly dry but we can still get good views of Dhaulagiri and Nilgiri mountains. We can roam the village around the evening. Overnight stya in Ghiling. We trace the same trail that we used to reach Lo Manthang. On the way to Chhuksang we can enjoy the great views of Himalayas and the small villages. Overnight stay in Chhuksang. This is our last trekking day and is a long one. After walking for while we leave the Mustang trekking trail and follow the Annapurna Circuit trail. We have our launch at Kagbeni. After launch we continue our walk to Jomsom where we stay overnight. Today we take an early flight to Pokhara. The airplane passes through a gorge between Annapurna and Dhaulagiri mountains making the flight an amazing experience. We can relax rest of our day in Pokhara. Overnight stay in Pokhara. Today we drive back to Kathmandu with the lifetime memories of the wonderful trekking experience. We follow the same route that we used to reach Pokhara. On the rest of your day you can go for shopping or relax in hotel room. Overnight stay in Kathmandu. Our Upper Mustang Trekking in Nepal comes to an end today. Our representative will drop you to the TIA in approximately 3 hours before your scheduled flight.